These are some of the quotes that were posted on the Facebook page of Life is a Game! in the months of January and February. 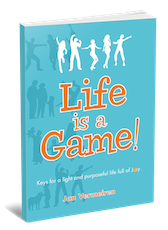 Check out the Facebook page of Life is a Game! for more inspirational quotes! Focus is an important part of feeling good and not being overwhelmed. Watch this beautiful short video (2:50) to hear it from a "focus expert". Just follow the instructions in the picture to use this simple, but effective breathing technique.